Antique and country style decor in a genuine 1840's Cottage restored to modern convenient living. Ideal getaway for romantic weekends with convenient location close to many Barossa attractions, wineries, gourmet dining etc. Log wood fire with generous wood supply provided in cosy lounge. TV, DVD and music for entertainment. Sleeps up to 6 guests - 3 bedrooms - two with queen beds and one with 2 single beds. Continental breakfast included in tariff with coffee and tea provisions. Local full breakfast produce provided on application (at cost of $15 per guest per day - required to order 7 days in advance of stay) . Complimentary wine and gourmet snacks, chocolates and port provided. Modern equipped kitchen, separate indoor dining room seating 6. Laundry facilities, modern bathroom with luxurious spa, large shower, toilet and separate second toilet for guest convenience. All linen included plus essential toiletries .Outdoor covered entertainment area with BBQ. Adequate off street parking for 6 - 8 cars. Pet friendly - Pet stay tariff charge and conditions apply. Only 1 -2 minutes drive to Angaston main street to enjoy galleries, cafes, specialist wine cellar doors and other gourmet and antique stores within 5 - 10 km. One hour easy drive from Adelaide via northern expressway. ***Child rate/fee applies to children under 14 ONLY*** Infants who do not use a bed stay free. A very pleasant stay in an old historic cottage, close to all Barossa attractions and it was wonderful to be able to bring our dog along for a weekend away. Only negative it’s the cottage is very cluttered and dark. We felt a bit overwhelmed with all the knick knacks and memorabilia. Great location and loved that it was dog friendly! Great location to the Barossa region wineries. Very neat and clean cottage with amazing decor, very cosy and comfortable. Great facilities and space for the 2 couples and our dogs! We thoroughly enjoyed our stay here, would highly recommend to others and would love to stay again. Thank you! The house had great character, great facilities and comfy beds! We thoroughly enjoyed our stay and will be back again soon! If it was just myself and my husband having a romantic getaway, it would have been perfect. Ross and Chrissy went out of their way to make sure that the backyard was safe for my Corgi, who travels with us, and for that I am truly grateful because it is not easy to find good accommodation that is dog friendly. I booked it for our Autistic son's birthday weekend, to get away as a family and have an adventure, and specifically because the HomeAway description says it has a Cubby house and large play area for children. Unfortunately there is no cubby house and the large play area is nothing but weeds and lots of ant holes with large ants that bite unsuspecting children who are playing out there. The house itself is fantastic for adult historians but for a child with special needs it was too cluttered and we spent the entire 4 days worrying about what he would break. So, while it didn't work for us, it is great property and for the right type of getaway I highly recommend it, just not for a family with very active children. Beautiful cottage in fabulous location. We loved our stay in this lovely cottage. 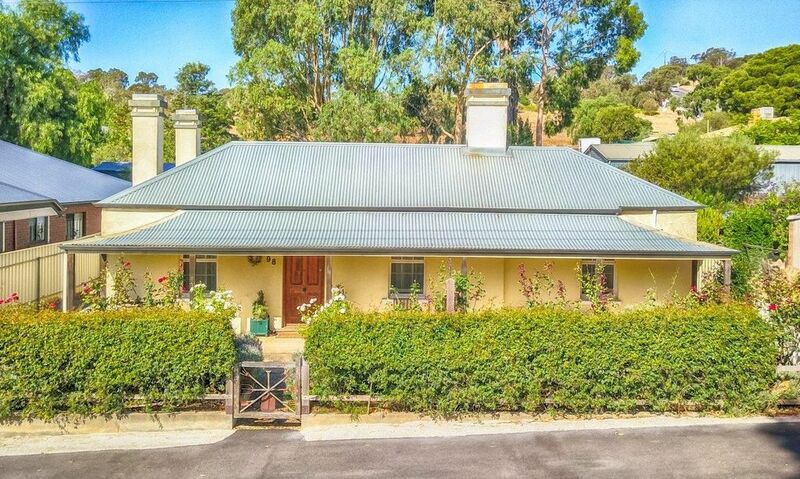 It is extremely well equipped, and in a fabulous location in Penrice with a short walk to beautiful Angaston. It was very clean and the owners were very helpful and attentive answering any questions immediately. The garden is spacious and secure with the fire pit and added bonus. We would recommend staying here and look forward to returning. A fascinating collection of antiques and curios creates a nostalgic ambience to transport you to a bygone era. Comfortable warm beds, a well equipped kitchen, hot shower/spa and a large well kept backyard await. Generous breakfast provisions, basic cooking supplies, wine, port and chocolates sweeten the sojourn. We stayed during one of the coldest times of the year, and unfortunately the wood fire and electric heaters only just kept us warm. This cottage would be better experienced in autumn and spring. A quiet, peaceful retreat, convenient to visit wineries and restaurants, and close enough to walk to Murray Street, Angaston for shops. It was a pleasure to stay in.